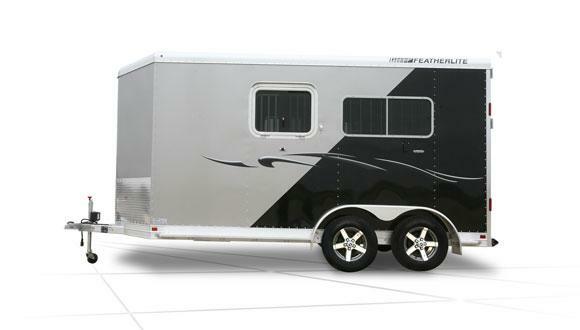 For added comfort and safety, the Model 9407 horse trailer features 3/4" thick rubber mats and rubber walls up 48", plus all the durability only an all-aluminum trailer can provide. Trailer includes a standard gravel guard, and side and rear ramp are available. 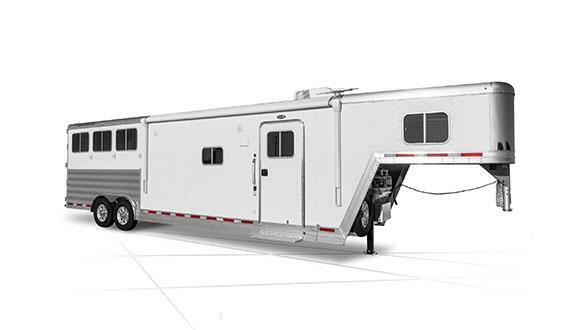 Rear Doors: For floorplans with rear doors standard, trailer includes double rear doors with windows, pipe hardware & removable post. For floorplans with a rear ramp standard, trailer includes 54" full width rear ramp with double doors above with double cam lock & windows. Double pipe hardware on rear doors act as holdbacks. Stall Dividers: Stall divider with shoulder separator & no back leg; Floorplans with rear ramp standard include stall divider with shoulder separator and back leg; Swinging head divider on non-manger floorplans. 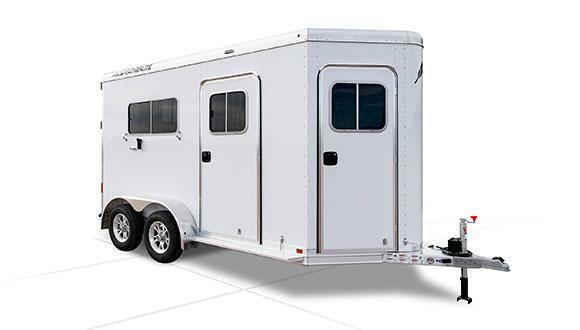 Weight: For the weight of this particular model, please download and reference the Trailer Weight Index for bumper pull horse trailers. 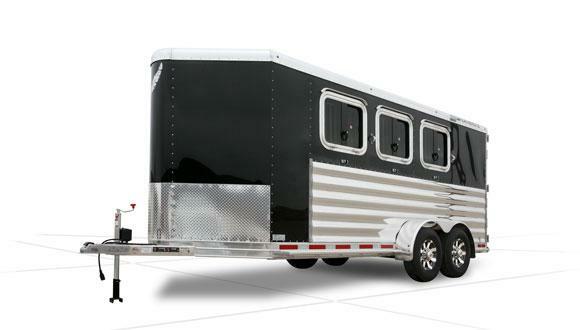 Model 9407 straight load bumper pull horse trailers can haul 2 horses. Model 9407 is 14' or 18' long and 6' 7" wide. 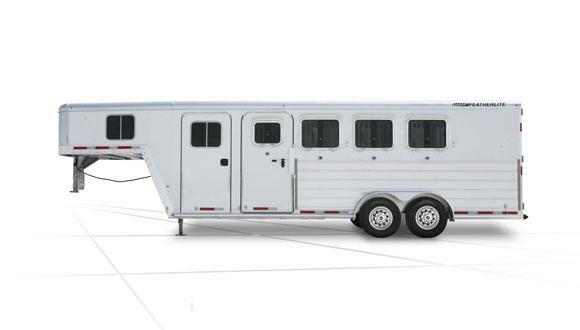 Various floorplans are now available with Model 9407, including: 48" dressing room with walk through door and feed mangers; 41" dressing room; 41" dressing room with side ramp: 41" dressing room with rear ramp; and 41" dressing room with side ramp and rear ramp. Saddle Rack: Adjustable saddle rack with blanket bar for each horse mounted on removable post; For floorplan with mangers, it's mounted under manger. 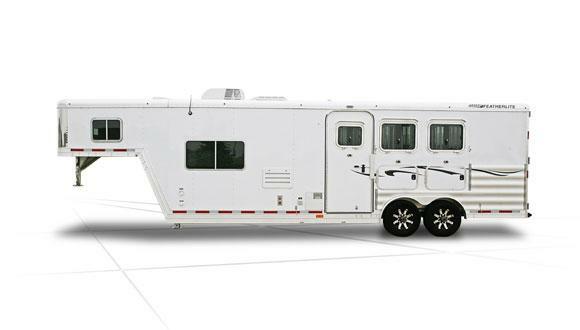 Dressing Room: 36" deluxe camper door with window, deadbolt & screen door; Clothes rod in non-rear ramp floorplans; Turf on floor; Brush tray; Halter bar; 14" x 14" roof vent in dressing room in floorplans with rear ramp standard.